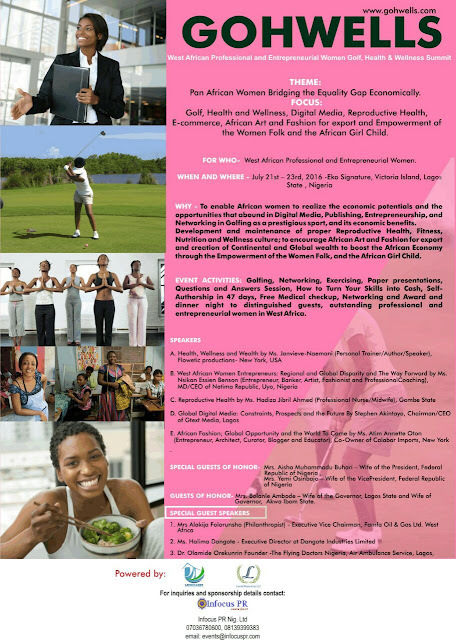 In mid February, this blog www.jennychisom.com was made an Official Media partner for the first entirely women-focused Golf, Health and wellness Summit in West Africa! So since then, I’ve been holding my breath to break the news and here it is. I decided to bring back the long –awaited interview segment with a chat with the International Business Facilitator and event initiator of the brand - (Mr. Charles Elisha Ekanem). With his team at Laurel Resources LLC, they are bringing a blast to West Africa in a summit themed “Pan African Women Bridging the Equality Gap Economically” coming in July to Lagos, Nigeria. Let me not take the words out of his mouth, just read and prepare to attend as a #JCB CEO or Fan! Get your golf balls ready! JCB: Tell us about yourself and what you do? Charles: I am Charles Ekanem, a Nigerian citizen. By God's grace I am in charge of Operations at Laurel Resources LLC. A Solution-driven Startup geared towards the provision of pragmatic and visionary products, services and technological solutions to Africa and other part of the world. We are a growing resource and facilitating company currently working on Golf, Health & Wellness Summit (GOHWELLS) www.gohwells.com . The aim of the summit is to enable African women to realize the economic potentials and the opportunities that abound in Digital Media, Publishing, Entrepreneurship, and Networking in Golfing as a prestigious sport, and its economic benefits. Also to see to the Development and maintenance of proper Reproductive Health, Fitness, Nutrition and Wellness culture while encouraging African Art and Fashion for export, to create Continental and Global wealth to boost the African Economy through the Empowerment of the Women Folk, and the African Girl Child. That’s a mouth full, I guess (laughing). JCB: Yes, but it shows how in sync you are with this event. So if I may ask, who will directly benefit from this event? JCB: When will this event hold and where? Charles: It will hold in Eko signature, Victoria Island Lagos on July 21-23rd, 2016. JCB: What are participants to expect on those days? Charles: They should expect a jammed impactful event for Golfing, Networking, Exercising, Marketing, Empowerment, Nutrition, Self-Authorship in 47 days, Empowerment creation, and Free Medical checkups. They will learn the impact of golf on global business, how to become a marketing guru, understand digital media and entrepreneurship. There will also be an Award and dinner night and will honour outstanding professional and entrepreneurial women in West Africa. The crème de la crème of women impacting Africa will be present and you can be sure that the line up of resource persons and facilitators is rich. JCB: Great! Back to your person; how can you describe your personality in relation to your Industry. Charles: I’d say, I’ve learnt to develop myself and have built a strong reputation that Nigerians are great people to reckon with in all ramifications. JCB: That’s awesome! ‘Repping Naija’ for good, like we say (Laughing). Going forward what have been your biggest achievement as a brand since inception, talking about Laurels Resources? Charles: Okay. I’d ascribe that to our ability to have advised others professionally on how to compete at the global level and also share ideas on how they can profit. JCB: What have been the recurrent challenges? Charles: I’d say it remains the issue of trust about Nigeria and Nigerians by people from other countries. Another thing is the issue of trust and communication with prospective clients. When it comes to effective utilization of technology and various means of communication I give to the Asians and Europeans. JCB: Hmmnn wow, Okay. How do you deal with times of low patronage or uncertainty in your work? Charles: I deal with it by reinventing knowing that Nigeria remains one of the countries in the world with enormous potentials to tap. JCB: What would you advice a Nigerian CEO or entrepreneur to never forget? Charles: For me, it will be that they should be humble, be great leaders, be attentive to changes, be supportive of others, be united and God fearing. This summit is also a great opportunity for them. JCB: That’s says it all. So now, which business mogul or celebrity inspires your work as an International business facilitator? Charles: Top on my list are Jack Ma, Founder of Alibaba and Mrs. Alakija, Executive Vice Chairman of Famfa Oil & Gas Ltd. They have not stopped interacting with all walks of life as well as giving back to the society. That is something very memorable. JCB: I learnt that Mrs Alakija will be at this event as well, yeah? JCB: What More can we say? Charles: Yea, very importantly, GOHWELLS was initiated by Laurel Resources LLC in Partnership with Infocus PR in Collaboration with LaurelGabe Solutions Int’l Ltd. In addition, I will love to express my sincere gratitude to Ms. Chi Tola, CEO of Infocus PR, Nigeria, Ms. Jenny Chisom, CEO of Jenny Chisom Blog, Ms. Iv Davies-Etokakpan, Mr. Fola Omokayode of Afo Clothing, Hitchme Communications, Primo Investment, Ms. Alex Okoroji, Ms. Faith Okoh-baya, Ms. Francisca Ogoh, Ms. Maimuna Garba who is the Chairlady (GM, NTA - Jigawa) and many others too numerous to mention. Our women and African girl-child needs the support of both national and international organizations doing business in West Africa to come out en mass and sponsor the event. Information transfer aster than education, therefore it is very pertinent for women in the region to utilize this great opportunity to better their lives and communities. Golf, Health, Wellness, Networking, Entrepreneurship, Technology and Fashion are all interwoven. And golf is were all business meets. JCB: Great. One more question on my mind. Why did you decide on Golf, Health & Wellness and Entrepreneurship? Charles: Golf in Golf industries economic, has been reported by various insiders as bringing in nearly 70 billion U.S Dollars per year. Its charitable impact is close to $4 billion per year through 143, 000 events and 12 million participants. On the other hand, by 2019 Digital Marketing market share will reach $56.61 billion. 126 million women will also be operating new businesses and another 98 million will be at the helm of established ones. However, there still remains a huge gender equality gap in Panama, Thailand, Ghana, Ecuador, Nigeria, Mexico and Uganda. Women are crucial to economic growth globally and it can only be achieved by being entrepreneurial. I know you have heard the saying, business deals are made on the golf course. Attend GOHWELLS and learn about the game of golf, how to become a marketing guru and build new business relationships. Our women can prosper by dealing on wearable fitness garbs, anti aging products, golf accessories, digital media (Bulk SMS and E-commerce), and many others. JCB: Wow! That's a lot of information that can't be Ignored. We look forward to it. Thank you and God bless! You read it right here, be sure that this event will expand your business network and strengthen existing business relationships.